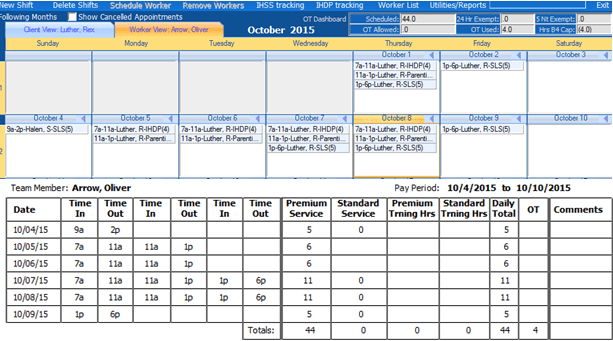 We’ve released several overtime updates to QuickSolvePlus the week of October 18th that specifically address the SLS overtime features. Please read about these core updates and how they may impact you. You can now set an effective date for when you want your SLS OT settings active. This means you can confidently maintain your schedules prior to this OT effective date and not be prohibited by any weekly overtime caps. If the effective date is left blank, and any SLS OT settings have been enabled, those settings will be applied to all calendars. Previously, to activate a worker’s weekly IHSS dashboard, each worker must have first been listed as “yes” to the IHSS Worker field in their HR profile. Now, instead of going into each HR profile one by one, you can do a mass update by selecting the “Cap Worker Weekly IHSS…” option under SLS OT Settings in Utilities. If that SLS OT setting is already selected, unselect and re-select to send the update to all HR profiles. The only function of this “IHSS Worker” option in QSP is to activate and display the worker weekly IHSS dashboard on their worker view in the scheduler. If one or both of the SLS OT Settings for “5 Consecutive Night Shift Rule” and “24 Consecutive Hour Rule” are selected, the “Sleep” check box will be active in the new and edit shift windows in the scheduler. Labeling a shift as “sleep” is only necessary if using the overtime exempt sleep rules. Sleep hours, now displaying as pink, will only be exempt from a worker’s weekly overtime calculations when it satisfies one of the sleep rules. HOWEVER, a sleep shift will stay pink regardless if a sleep rule has been met. If you want up to 8 sleep hours to calculate as OT exempt in QSP, then the shift length must be at least 8 hours in length and satisfy the rules. The scheduler is responsible for labeling the appropriate shifts as “sleep”, and QSP will provide the necessary prompts when a sleep shift doesn’t meet the sleep exempt requirements. A scheduler must acknowledge these prompts to proceed scheduling. If you are currently building daily schedules from 12:00 a.m. to 12:00 a.m., in order to capture a full 8 hours of sleep on one shift, especially those that end before 8:00 a.m., the start time needs to begin on the prior “day”. Based on the way QSP has been designed to recognize and calculate sleep exempt shifts, you won’t be able to label, let’s say, a 10p-12a shift with 2 hours of sleep, and have its consecutive shift from, let’s say, 12a-6a with 6 hours of sleep, calculate a total of 8 exempt sleep hours. The shift would need be created as one shift from 10p-6a. We’ve released an update that adds Parenting Support hours to SLS Overtime calculations on Payroll Reports and Simple Time Sheets. When OT reports are enabled, Simple (not Detailed) Time Sheets will display any OT hours. Previously, Parenting Support hours were listed on a separate time sheet. They’re now, when OT reports are enabled and if applicable, included with all the SLS Overtime service types. “Payroll Reports” include: Simple Time Sheets, Payroll Processing Report and Condensed Payroll Processing Report. When OT calculations for Payroll Reports are enabled, they will be generated in weekly batches based on how your agency work week has been defined in SLS OT Settings. Weekly SLS overtime will not calculate for mid-week pay period date ranges.